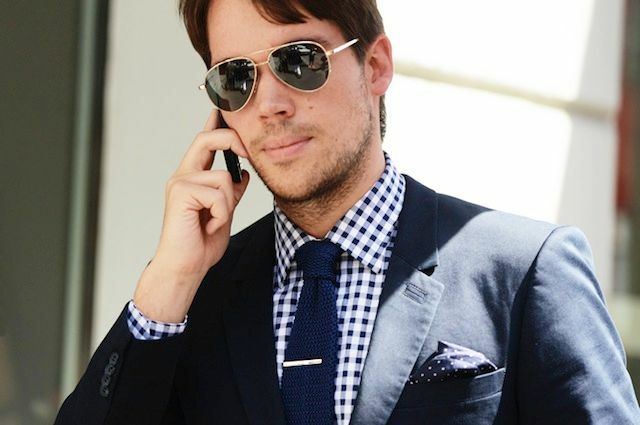 Spring is finally arrived and then, what a gentleman should have in his perfect wardrobe for spring / summer? – A dark gray suit in tropical wool. 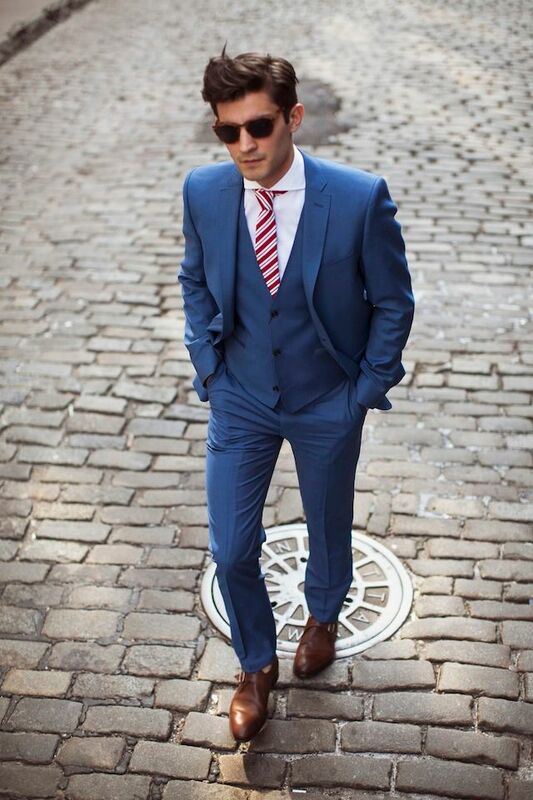 – A gray suit and blue striped lightweight thin and spaced, with vest, with a weight suitable to be worn eight months a year. – A Prince of Wales suit of summer weight. – A blue suit in linen. 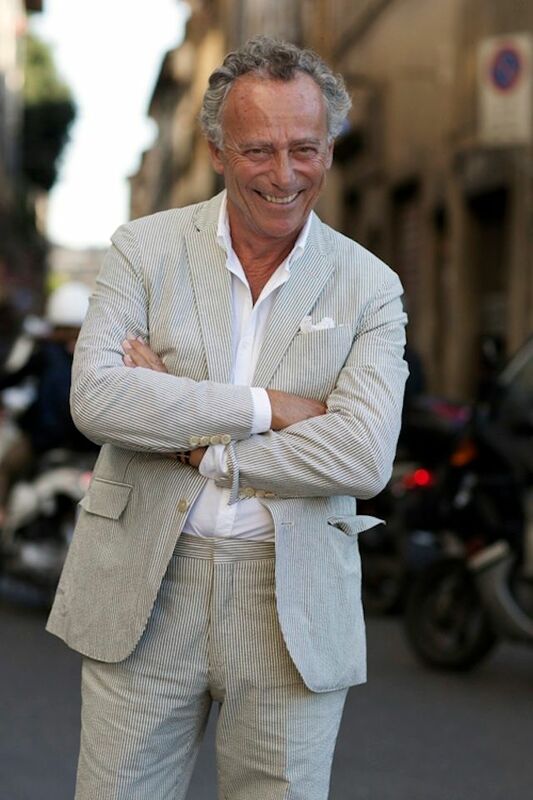 – A light-colored suit in tropical wool or gabardine. 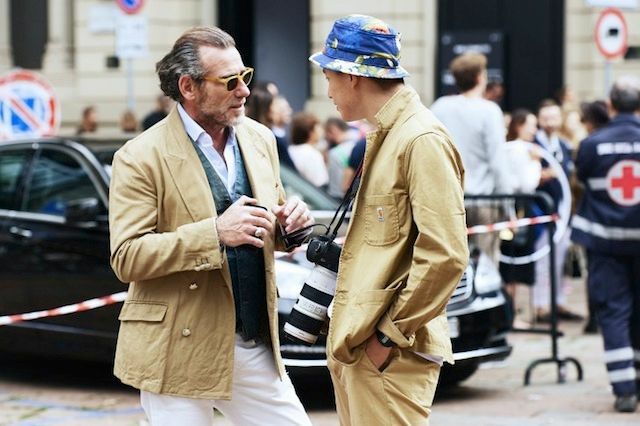 – A beige or olive green suit in cotton. – A blazer with white and blue stripesin seersucker cotton. – A blue blazer of summer weight, one or two breasts. – A plaid sportive jacket in cotton. The main elements to be combined, in a man suit, are: jacket, shirt and tie. To these you must add the small pocket handkerchief and the socks. A further element is represented by the gilet, that however usually it enters in the game only if it deals with a “broken” suit and not with suit made all of the same fabric. The initial glimpse is made of colors, that must be judged in base to the approaches. In spring you can dare with more energetic and garish colors, freeing the imagination and creating interesting combinations and texture. The effectiveness of these, is purchased above all with the experience, in fact, harmony and deliberate contrasts are reached only with practice. 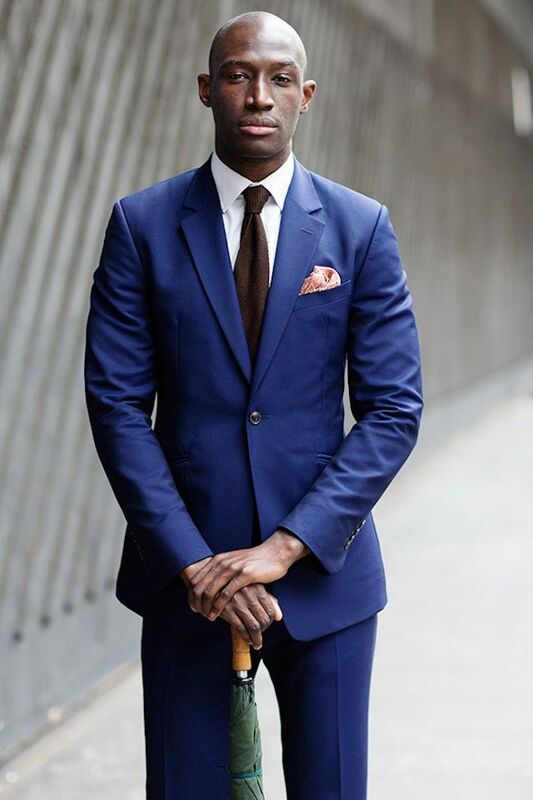 If for a businessman the combinations will always played on the gray, blue and white colors, for a gentleman, in the broadest sense, there will be many opportunities to play on and partly differ from the more formal combinations. Here is some concrete proposals for approaches and combinations on suits. – Grey suit in tropical wool. The solutions are two, in the case which the tonality is dark, a blue fil-à-fil shirt, with neck and cuffs in white color; tie in printed silk to red fund with small white-grey-blue sketches, white pocket handkerchief; blue or bordeaux socks. Or: shirt with tiny stripes in white and red, tie in printed silk with a yellow fund and blue / red sketches, or with a blue fund and grey / yellow sketches; white pocket handkerchief; blue or bordeaux socks. The proper shoes are brown, of the type oxford-francesina or derby. 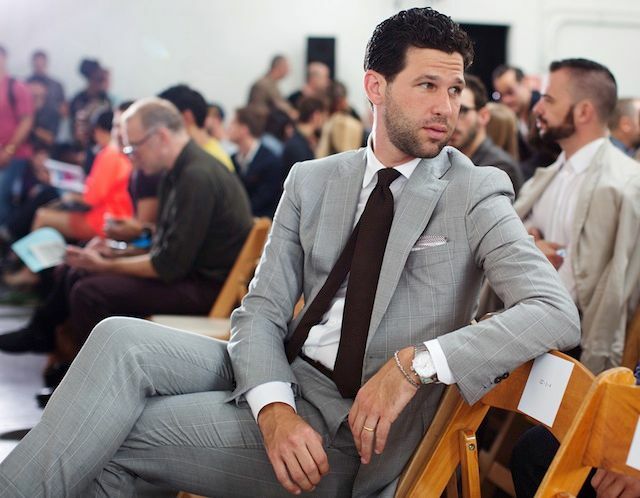 – Grey suit with stripes. The fabric of this classical suit of middle-light weight, from the middle-dark tonality it is ruled from thin distant lines (formed by dots, pin) around a centimeter and a half the one from the other. Perfect is a shirt with small squares in whites and rose pale; tie of embossed silk, in green united shade, white pocket handkerchief with to read panels edgings pink-grigie or pink-green; stockings very dark grigie. The alternative is a shirt it cremates in very light tone; tie of silk operated with fund grey pearl and minuscule red-blue geometric motives; white small pocket handkerchief; stockings grey dark. Or still, white shirt; tie bright blue to white pois; white pocket handkerchief; blue socks. To be more informal, a shirts in celestial blue. The shoes are brown for a everyday use, like the oxford-brogues. For more formal occasions, are suitable the black ones of the same type. 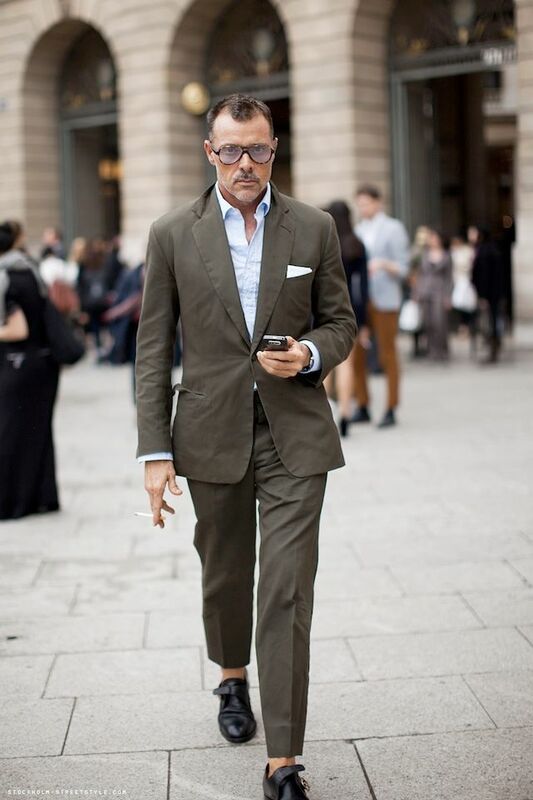 – Olive green suit in cotton. Another classic of the summer season, valorised, as regards the shirts, with matching blue, to yellow, to rust. The predominance of green makes it preferable combinations with blue ties, yellow, gold, gray and rust (not burgundy) in various shades and hues. – Suit in blue sugar paper. Disengaged, but elegant solution that can be implemented in a variety of fabrics: linen, linen blend silk, cotton. One solution might be: a pale blue shirt in lightweight cotton, a silk tie with a blue background and thin white diagonal stripes, red, silver, white handkerchief, socks blue. Alternatively, a fil-a-fil shirt of blue cotton with white collar and cuffs, a deep red silk tie with tiny white polka dots, white handkerchief, blue socks. Finally, a white shirt, a tie in yellow mustard load; handkerchief white, two-tone shoes. The shoes can be brown, burgundy or black. – Suit or jacket in ecru linen. The reliable pairings for this tissue, with regard to the shirt, are white, pale blue, pink and lilac, all in extremely tenuous shades. As for the tie – obviously taking care of the color of the shirt – can be light blue, green, brown, burgundy, red, blue or rust. An original approach for sure, without providing for the tie, a shirt is dark brown or rust. 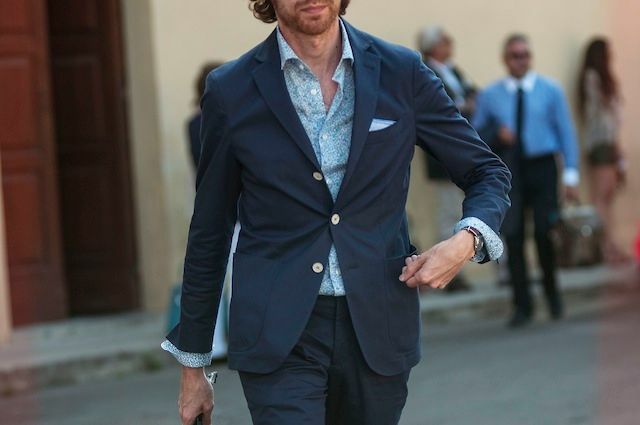 – Blue blazer for summer. It is a jacket with metal buttons made to be coupled to shirts a bit bolder than usual. It can be paired with colored pants, such as white or yellow; a white shirt with red stripes widely spaced, blue tie with designs of exercise equipment (rackets or golf clubs); handkerchief white with red squares and blue socks in solid colors or patterned background with blue or burgundy. The previous combination may be inverted: a white shirt with blue stripes, red or burgundy tie. Another combination could be: button-down shirt in blue and white checked, silk knit tie in pale yellow, red silk handkerchief in a small drawings on blue-gray; socks in plain or patterned background with blue or burgundy . The shoes are brown like derby with laces. nice suits, love the sharp blue ones!